IT’S GREAT THAT we’re building and upgrading our homes to reduce energy costs and the needless waste of precious resources. But in our eagerness to use the latest green technology for our indoor living spaces, it’s easy to overlook the need to create sustainability in the environment right outside our windows. That oversight may stem in part from a traditional model that has conditioned us to see the home landscape as a formal extension of our living and dining rooms. Thus, we might regard our high-maintenance, manicured lawns as a kind of carpeting to be periodically “vacuumed” of leaves and weeds. Or, we’ll plant exotic flowers and shrubs simply to create eye-pleasing objects around the lawn chairs. It’s all lovely, but that model can divorce us from a healthier home landscape ecology and from a deeper connection to the natural world. An exciting alternative to that traditional approach is restorative landscaping. Advocates of this ecofriendly system seek to foster the diversity and biological balance of our homes’ outdoor living spaces. As Lattrell advises, introducing native trees, shrubs and plants into your homescape helps to protect those varieties from getting squeezed out by rapid development, including the many birds and beneficial insects these plants attract. Hardy, welladapted native plants typically need less care and water. They also add diversity and bring a “wild” fieldand-woodland feel to your home site. But you don’t need to exclude all traditional plantings. A number of non-invasive, non-native trees, shrubs and plants also contribute to nature’s food web. The restorative landscape model also promotes site-specific soilbuilding methods and erosion control. And it discourages the use of chemical fertilizers, herbicides and pesticides. 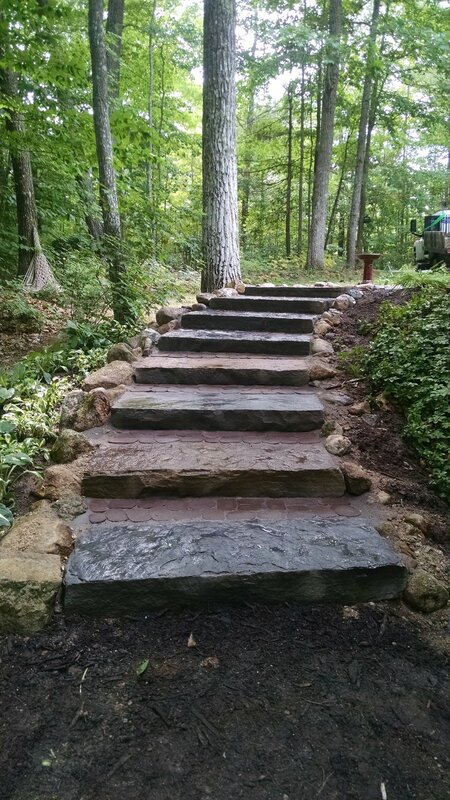 Such lofty ecological goals might seem overwhelming at first, but you can bring restorative landscape concepts into your own backyard, step by step. Rick and Denise Sawyer co-own Fernwood Nursery and Gardens, a home-farm enterprise beautifully situated on 20 acres in Montville, Maine, a widespread, rural area located 20 minutes from coastal Belfast. The Sawyers propagate one of the largest collections of shade-tolerant woodland plants in New England. Their collection includes well over 100 native varieties, such as jack-in-the-pulpit, lady’s slippers, Solomon seal, native ferns, cardinal flowers, bunchberry, bloodroot and twinflower. Flowers include some sun-loving herbaceous perennials, too, like wild asters, goldenrod and milkweed. “All plants have a desire to self-propagate. Every time you plant a native variety in your landscape, you’re promoting native diversity,” Denise said. Woody, regional shrubs, such as native dogwoods, swamp azaleas and sweetfern, and an extensive assortment of nonnative, shade-loving hostas, ferns and rare specimens, add to their colorful collection and bring rich diversity to the home landscape. “Visitors see that their palette of native garden plants can be more diverse than they thought,” Rick said. Their plants are low-maintenance and require no staking, spraying or overwinter care, horticultural virtues that go a long way toward restorative landscaping. “There are not a lot of nurseries that propagate native plants on site. Nothing wild is dug here. That is important,” Denise said, referring to her ethical stand about not picking or digging up wild plants, which can deplete populations. Almost all plants are raised outdoors. “These are cold hardy plants. They grow in their natural environment. We don’t alter the air temperature they grow in. We use site selection,” she explained, meaning that plants are raised in soil, moisture and light conditions that match their preferred, natural setting. "We grow them without benefit of winter protection. Once they’ve established their roots, they’re on their own,” Rick added. “We’ve seen plants that have survived quite well in an open, sub-zero winter,” a cold-hardiness factor that makes these native plants suitable for northern climes. Each season, more than a thousand plant-loving people, with all levels of gardening experience, come from up and down the New England coast to visit the woodland nursery. Many summer visitors have second homes in places like Bar Harbor, Isleboro, Damariscotta and Portland, Denise noted. Others are in the process of building, or have already built, energy-efficient homes. “They want to take it one step further in restoring the landscape,” she said. The nursery also works with landscapers throughout the state and as far away as Boston. Rick had more tips: “See what’s growing on your house site before you first start to clear it. Choose plants that are growing there already, such as a swath of wintergreen, or plants that will grow in a like environment,” he said. “What is most exciting for me is to see people who are choosing native plants instead of just growing a traditional flower garden. They’re having an intimate relationship with the plants around their home. You can’t go wrong with that kind of relationship, even if it means you’re pairing native with non-native varieties,” she said. Fernwood is open to the public from about May 1 (weather permitting) to Oct. 15. Matthew Bourne got his first introduction to landscaping by mowing lawns for extra money while in high school and college. “I saw a lot of destructive practices — lots of chemicals being applied everywhere — a lot of poison going into the ground and air. I decided, when I started my own business, it would be different,” he recalled. Bourne kept his promise. Today, he owns and operates Bourne Landscape, LLC, a full-service landscaping business based in Gray, Maine. He launched his enterprise in 2004, after he earned a master’s degree in sustainable landscape planning and design at The Conway School in Conway, Mass. “It was an ecologically based, sustainable program. They taught me to be a land steward and not just a practicing businessman,” he said. 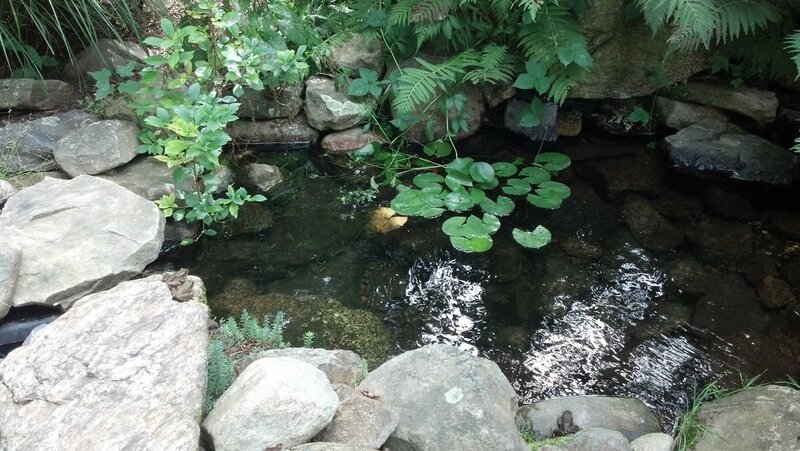 Today, he coaches his clients to appreciate the virtues of restorative landscaping, including the use of native plants and rocks, and erosion-prevention techniques. “It’s been a battle, but it has become more of a trend in the past five or 10 years, along with the renewable energy and organic movements. I’m proud to be a part of that in my own niche,” he said. He works mostly with residential properties in southern Maine, but also with commercial businesses or conservation groups, such as Maine Coast Heritage Trust. Typically, he starts with a site analysis to determine the lay of the land, what materials would do well on the site, the nature of existing plants, water issues, soil and other key environmental conditions. “We do a lot of stone pathways — gravel paths, where water can infiltrate the ground, particularly if the home is on a slope, so we can contain erosion.” This is important because Bourne does a lot of work with waterfront property on Maine’s lakes and rivers. Not every property owner follows conservation guidelines, he noted. “They slash the site, excavate and then plant grass. They want to open up the view of water and mountains, so they go in and clear-cut their land. This can leave them with erosion problems.” To help resolve erosion threats, he might install “buffer zones,” protected areas between the property and immediate shore line. “We plant them with native plants and shrubs with good, deep root systems to catch runoff,” he said. When needed, he’ll create a rain garden. “It’s a shallow depression, a small-scale excavation in the ground, say, a 10-foot-wide circle or a kidney-shaped basin, about 3-to-4feet deep. We plant them with aesthetically pleasing native plants that naturally grow in wet areas, such as certain types of irises. The plants direct the run-off and create a temporary holding pond. The water dissipates into the soil instead of flowing into streams, rivers, lakes and ground water. It’s a storm water management practice,” he explained. Thomas Berger, owner and operator of Green Art in Kittery, Maine, is a landscape designer, consultant, master stonemason and sculptor. In business for 22 years, his landscape design includes stone retaining walls and water-permeable walkways. He also creates stone sculptures made from Maine and Vermont granite, and he is a member of the Ecological Landscaping Alliance (www.ecolandscaping.org), based in Sandown, N.H. He likes to amend soil with shredded leaf compost, adding that it’s important to use good quality compost that is free of contaminants. “Choose commercial compost from a well-maintained, reliable source. If paper products go into making compost, inks or other substances can contaminate the soil,” he said. To prevent erosive runoff, water-permeable pathways, driveways and patios must be built correctly, he added. “To create a brick or flat-stone walkway, you always need a crushed stone base under the permeable, surface layer. Otherwise, water will seep onto the walkway and create surface runoff. An avid bird watcher, Berger points out that native plants contribute far more to the food chain of wildlife than most non-native plants. “Some alien plants provide berries for birds, but generally, they don’t provide food that attract the right insects that birds need to eat. During the breeding season, even hummingbirds catch aphids and caterpillars for their young. Alien plants nourish very few species of moth and butterfly caterpillars,” he said. Berger’s butterfly and stone sculpture display garden, designed with native plants, ponds and a miniature garden, is seasonally open to visitors by appointment and on Saturdays. 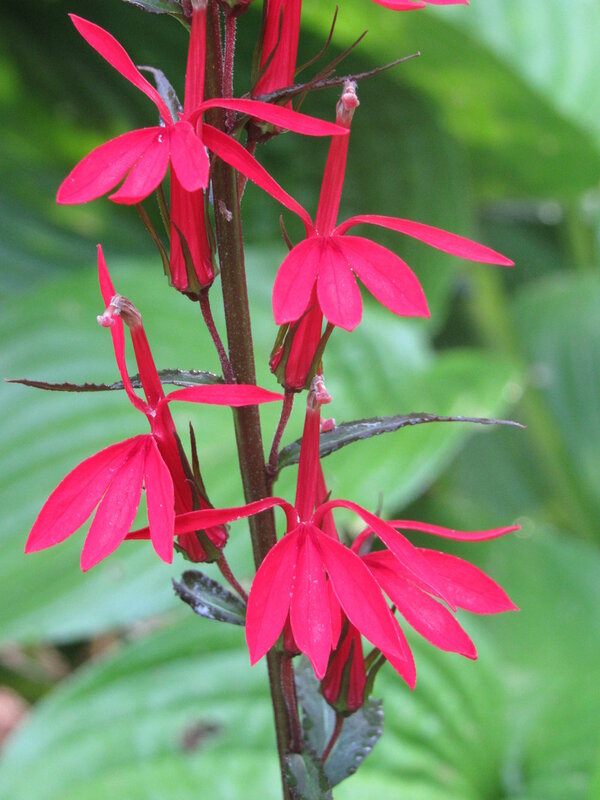 A wealth of information on native garden plants can be found in the University of Maine Cooperative Extension Service bulletin #2500, compiled by ornamental horticulture specialist, Lois Stack. The bulletin offers hundreds of recommendations for native trees, shrubs, perennial flowers and ferns. The information includes the common and scientific names of each species, its preferred light, moisture and soil conditions, its height, and a brief comment on its noteworthy traits. 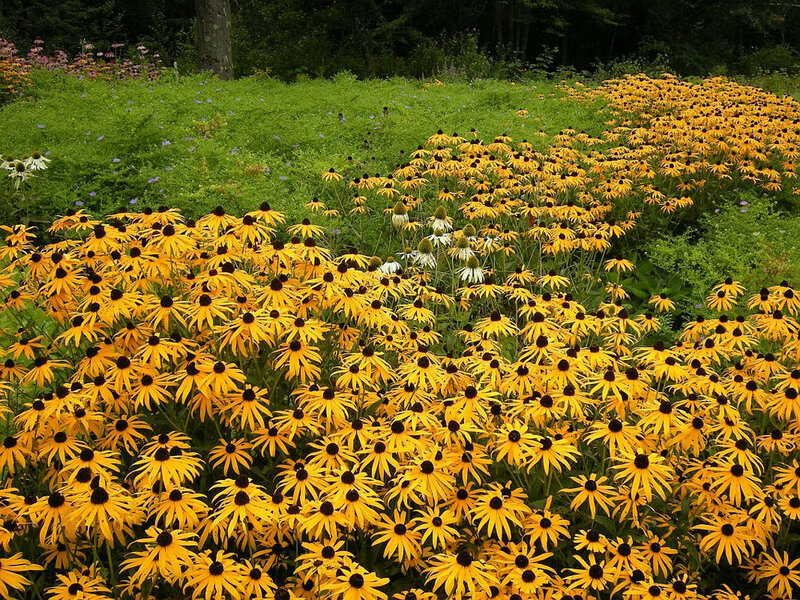 It also includes a number of non-native garden plants to avoid because they are considered invasive in Maine. Stack warned that collecting plants, cuttings, seeds or sods from the wild could devastate natural populations. Many native plants recommended in the bulletin can be found at local garden centers, she noted, but be sure to ask if their native plants are nursery propagated. 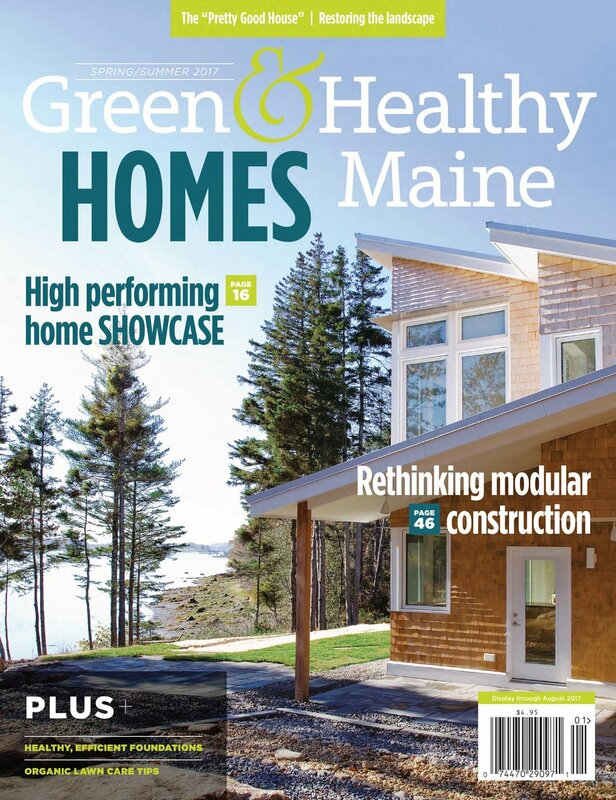 This article was reprinted from the spring 2017 issue of Green & Healthy Maine Homes. Subscribe today!